Thursday 2nd November 4 p.m. Kirby B02. 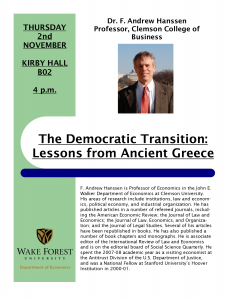 Dr. F. Andrew Hanssen is Professor of Economics in the John E. Walker Department of Economics at Clemson University. His areas of research include institutions, law and economics, political economy, and industrial organization. He has published articles in a number of refereed journals, including the American Economic Review; the Journal of Law and Economics; the Journal of Law, Economics, and Organization; and the Journal of Legal Studies. Several of his articles have been republished in books. He has also published a number of book chapters and monographs. He is associate editor of the International Review of Law and Economics and is on the editorial board of Social Science Quarterly. He spent the 2007-08 academic year as a visiting economist at the Antitrust Division of the U.S. Department of Justice, and was a National Fellow at Stanford University’s Hoover Institution in 2000-01.